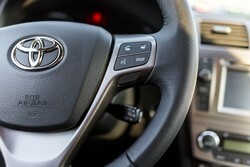 Toyota is suing two independent retailers in Australia, accusing them of knowingly selling counterfeit components used in airbags. The company said said in a statement that the actions of the two unnamed retailers in supplying the products - spiral cables - amount to "trademark infringement" and "misleading and deceptive conduct." "We are concerned that customers have been misled into believing they have purchased a genuine Toyota part," said the carmaker. "Internal testing found that the counterfeit airbag spiral cables are of inferior quality, which poses a number of potential risks to customers," it added. "It is our expectation that the independent retailers will contact the impacted customers to advise them that they have purchased counterfeit parts and replace the airbag cable with a genuine Toyota part at no cost to the customer," said the company.